Live performance of Shakespeare’s historical play at the reconstructed Globe Theatre. 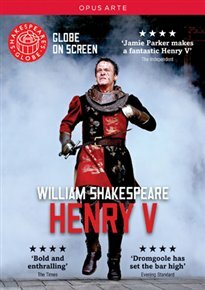 The plot follows King Henry V, here portrayed by Jamie Parker, as he attempts to conquer France during the Hundred Years’ War. Other cast members include Brendan O’Hea, Paul Rider, David Hargreaves and Brid Brennan.